Formula: 5 – 10 – 5 plus Iron & Sulfur (Also contains Zinc, Calcium, and Magnesium) Contains chelated iron as an iron source. Gro–Rich Garden Fertilizer provides the recommended formula by local leading garden experts recommended for the Rocky Mountain Region. Gro–Rich Garden Fertilizer is unique in its organic base offering nutrients to your plants while improving the health of your soil. Gro-Rich Garden Fertilizer is Organic Based and fortified with DPW (Dehydrated Poultry Waste). DPW offers nutrient value plus billions of beneficial micronutrients that improve the uptake of nutrients and your soil texture. Gro-Rich Garden Fertilizer contains secondary nutrients for optimum plant production + Chelated Iron, Sulfur, Magnesium, & Calcium). Gro-Rich Garden Fertilizer will increase the number of blooms on flowering plants. Gro- Rich Garden Fertilizer will increase the number and size of vegetables. Bedding Plants, Flowers, Vegetables Tomatoes Apply 4 LBS/100 SQ FT(100 SQ FT = 10’X10′ Area) Mix into top 6 inches of soil Apply 2 LBS / 100 SQ FT or per 50 Feet of row. Feed once at planting time. Feed monthly through the growing season. Roses and Ornamental Flowers Apply 3 LBS./ 100 SQ FT (100 SQ FT = 10’X10′ Area Apply 2 LBS / 100 SQ FT or per 50 Feet of row. Feed once at planting time. Feed monthly through the growing season. Trees Apply 1 cup in the planting hole and 1 cup for every 3′ of height in the area around the hole. Apply 3 lbs./ inch of trunk diameter. Spread around circumference of tree working towards the trunk Begin feeding in spring when leaves first appear, and again in early fall. Container Plants Apply 1 cup per 2 gallons of soil, mix thoroughly with soil. Apply 1 cup per 2 gallons of soil Feed once at planting time. Feed monthly through the growing season. Shrubs & Evergreens Apply 1 cup in the planting hole and 1 cup for every 3′ of height in the area around the hole. Apply 2 cups for plants up to 4′ in height, and 1/2 cup for each additional foot. Feed once at planting time. Feed monthly through the growing season. Water Thoroughly After Applying Fertilizer. 1lb of Gro-Rich Fertilizer = approximately 2 cups. 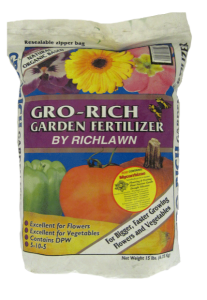 Gro Rich Garden Fertilizer comes in a 15 # resealable package so that it can be used as needed without spilling when not in use.